There may be a God after all or at least an element of rough justice. John Shannon, the former chief executive of AssetCo, the company awarded a massive contract to service and replace London and Lincolnshire’s fire engines is facing bankruptcy. He is the man who wined and dined Brian Coleman, the former Tory chair of London fire brigade who is now facing assault charges, and gave Coleman a £350 Harvey Nicks hamper for Christmas. He also got the notorious strike breaking contract to supply cheap labour to replace firefighters in the capital. He brought AssetCo to the brink of bankruptcy leaving a trail of unpaid bills – one for the use of a personal executive jet – and forcing backers of the firm to take a 78 per cut in their debts, including taxpayer-funded Lloyds TSB, now proud and reluctant owners of London’s fire engines. Small shareholders who were daft to bet on privatisation as a one way ticket to riches were ruined when they became worthless. He lived a life of Riley claiming a salary of around £300,000 a year and paid himself dividends easily equal to that amount while the gravy train lasted. He was actually thrown off the company by his fellow directors after they discovered they were deep in debt and he tried to get a Bahrain bank, Arcapita , to take over the firm. When the dust settled they then discovered – on top of all that – he had taken out loans of over £500,000 in AssetCo’s name on other failed businesses and overvalued property. But it now looks as though events are catching up with him. 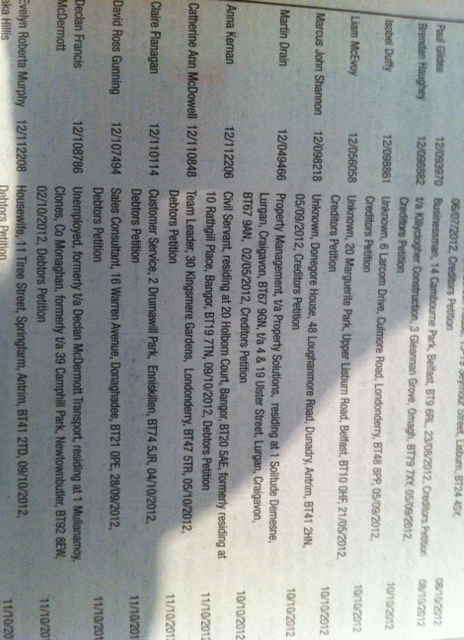 A journalist contact in Belfast has spotted that he is facing a creditors’ petition ( see picture) from people he owes money and they are moving to bankrupt him. His Northern Ireland seven bedroom mansion set behind electric gates and in seven acres of grounds is up for sale for £750,000. You can view this here ( http://www.btwcairns.com/property_specific.aspx?ID=18390) . You can see a sideshow of the extensive improvements he made using money from taxpayers in London and Lincolnshire on the estate agents site. In a way this is a great morality tale of our time. And it is not to the credit of the management of the fire authority who did nothing while AssetCo burnt. Indeed Coleman cosied up to him more than ever. And even top officials took the AssetCo shilling when they retired from LFB, hoping to make money out of the privatisation for themselves. It will be interesting to see how James Cleverly, the new Tory chairman of the authority, handles the rest of this contract. He appears to be ignoring the fact that it is in the hands of baronet, Sir Aubrey Brocklebank, living in a three bed semi. 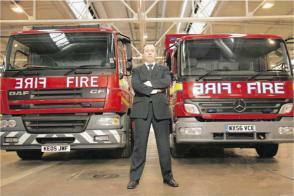 So far the dealings done by London Fire Brigade are no pin-up boy for privatisation anywhere. This entry was posted in privatisation, town hall, Uncategorized and tagged assetco, brian coleman, john shannon, london fire brigade. Bookmark the permalink. ← Should ministers be able to snoop on your calls and e-mails? Enter a competition to have your say. Can someone please name me a privatization that has actually provided better, cheaper, more efficient services as a result, as I am at a loss. The Railways, Gas, Electric, and BT certainly didn’t do it. shame, and Coleman arrested for common assault! A small bit of justice. Why is the UAE doing business with this company?